I attended public school from Kindergarten through part of 9th grade. During those years, I had some good teachers, some bad teachers, and two fabulous teachers. My kindergarten teacher, Mrs. Andrews, was amazing and I have wonderful memories of all the fun things we did in her class. Each week we focused on a different letter of the alphabet and one of my favorite memories from her class was on letter D week. Mrs. Andrews came into class dressed up as a baker with doughnuts in sandwich bags pinned all over her apron. We also got to go on a field trip to a bakery to see how doughnuts and other goodies were made. Some other memories I have of Kindergarten are making stone soup, show and tell, our class guinea pigs, craft projects, making ants on a log and milkshakes in the cooking corner, and the end of the year class picnic at Mrs. Andrew's house. She was a memorable teacher. My fifth grade teacher, Mrs. Hoffman, was my other favorite teacher. She was beautiful, kind, and very creative. While studying Native Americans, we built hogans out of popsicle sticks and wove mini blankets. Mrs. Hoffman also had us make up our own Native American names and then we wrote stories on pretend bark describing what our Native American names stood for. I gave myself the name of Sun Dancer because I loved tap and ballet. While learning about the legal system, our class put on a "Jack and the Beanstalk" play where the Giant was suing Jack for trespassing and stealing. We got to perform our play at the town court house. I played the judge and my two best friends were the lawyers representing Jack and the Giant. When I think about what kind of teacher I want to be to my children at home, I often draw inspiration from Mrs. Andrews and Mrs. Hoffman. I like to include plenty of creative hands on learning projects because I know these are the things my kids will remember years down the road. I have posted photos of our latest projects throughout this post. I like to keep the projects simple and use materials we already have around the house. We recently finished up our World History section on the Greeks. We made mini coil pots out of fimo clay which both my kids loved doing. The pots only took 10 minutes to bake in the oven and the kids have had fun using them for play cooking and as a place to store little treasures. 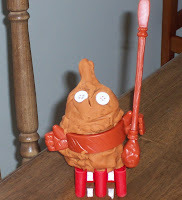 Right now we are learning about Ancient China so we used our play dough to make Terracotta Warriors from the Ch'in Dynasty and also a replica of the Great Wall. 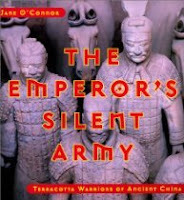 Jacob was especially fascinated by the story of the Terracotta Warriors and we found a great book for kids called The Emperor's Silent Army. Today we learned about Scythian and Mongol nomads. The Usborne Book of World History had instructions for an applique craft and we decided to give it a try this afternoon. We simply cut out red felt hearts and stitched them onto a larger square piece of white felt. The kids wanted to add a button to their mini quilts which was fine with me even though it was not historically accurate. Everyone needs to learn how to sew buttons on in this day and age! Jacob is getting much better at sewing and did most of the project himself. Rosa needed more help but she is catching on to the concept of sewing and never lost interest throughout the whole project. I want both my kids to know how to sew at least in a basic manner so they can repair their own clothes and such. I spent too much time in college helping my male friends mend their clothes and backpacks and I don't want my own children to be lacking this skill. Last but not least, Jacob has been loving the K'nex Super Structures 50 Model Building Set he got for Christmas. He has built all the models in the book that came with the set and has branched off to build his own impressive creations. The train was Jacob's own idea and built with no help from us. Jacob definitely has a talent for designing things and he is already way ahead of his parents in this department. I highly recommend this K'nex set if you have a child who loves to build. Jacob built his own Parthenon out of K'nex while we were studying about Ancient Greece and he often builds things related to what we are studying with no prompting from me. This is the kind of enthusiasm and creative learning which I love to see happening in our home. I want Jacob to look back at his time homeschooling as an exciting time of creative learning and discovery just as I look back with fond memories on my time with Mrs. Andrews and Mrs. Hoffman. Very sweet post! Your teachers would be touched to know how they've affected your life. Thanks for sharing! I have tried to get K interested in sewing but never happened. Now she is doing it at Fiber Arts (library) and is loving it. Go Figure. C-ya at the next mtg. I will bring LHFHG for you to look at. I am considering homeschooling next year and while researching stumbled across your blog. Your posts are very inspiring and help me to see that the possiblilties are endless. Thanks! So, where did you go to school after 9th grade? Love that I found your blog...such creative ideas in this post. I hope to read more right now. :) I've been blogging for about 2 months now and have mostly been writing about running but am now ready to find some more creative mommy blogs! Yours is a great one!